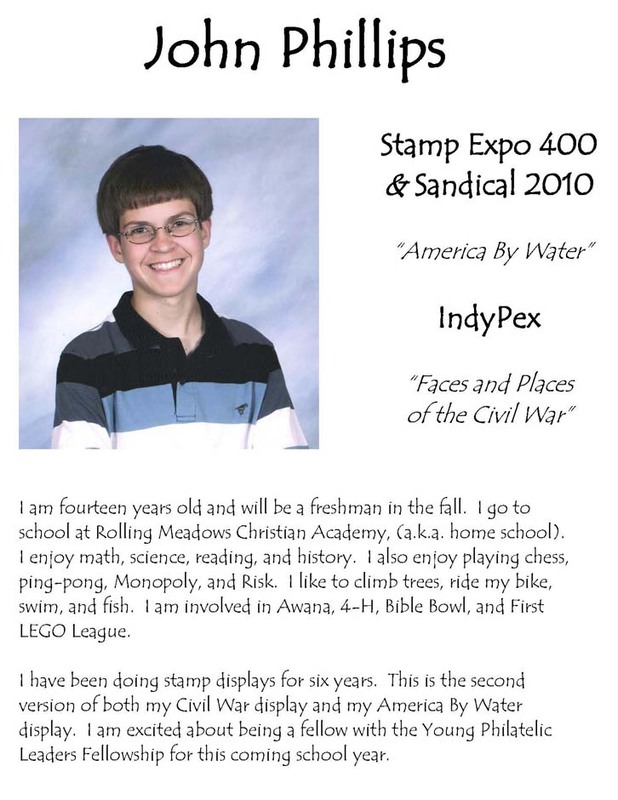 The following exhibits competed in the 2010 AAPE Youth Champion of Champions held in conjunction with the Minnesota Stamp Expo, July 16-18, 2010. 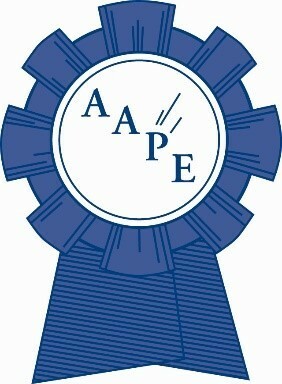 *Some exhibits are representing more than one show because they were the only qualified exhibit for the AAPE Youth Grand Award at a subsequent show. 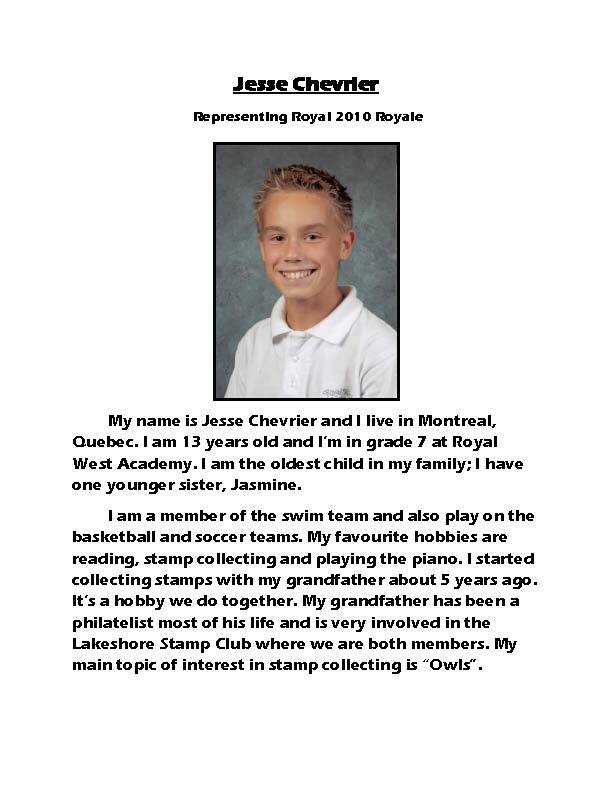 Jesse Chevrier (13), representing Royale 2009, "Owls" - This exhibit shows some of the many owl species and sub-species, their habitat and the type of food that they eat. Owls are also the subject of many interesting stories and have been featured in children�s books, films, and cartoons, and have been stylized into the design of stamps and cancellations. 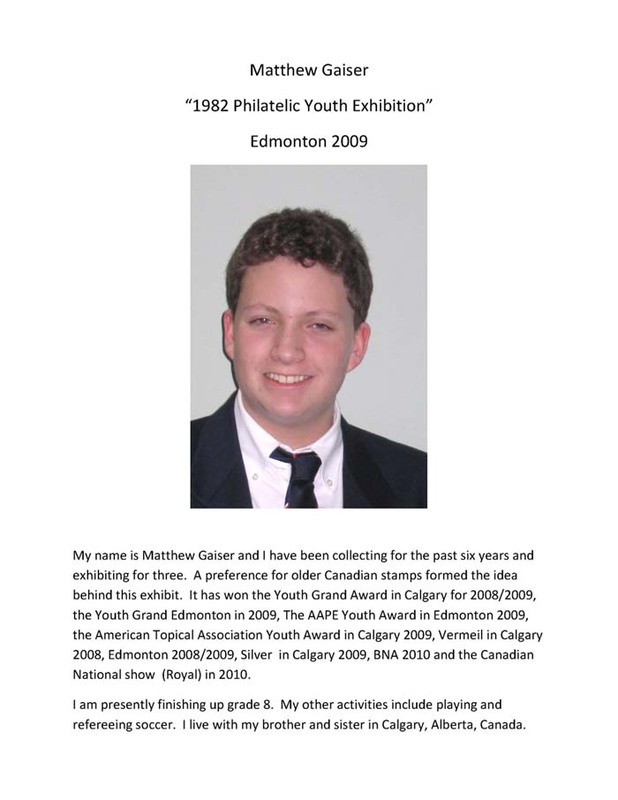 Matthew Gaiser (13), representing Edmonton Spring National 2009, "1982 Philatelic Youth Exhibition" - A one-frame exhibit about the 1982 Toronto philatelic youth exhibition and the original stamps. 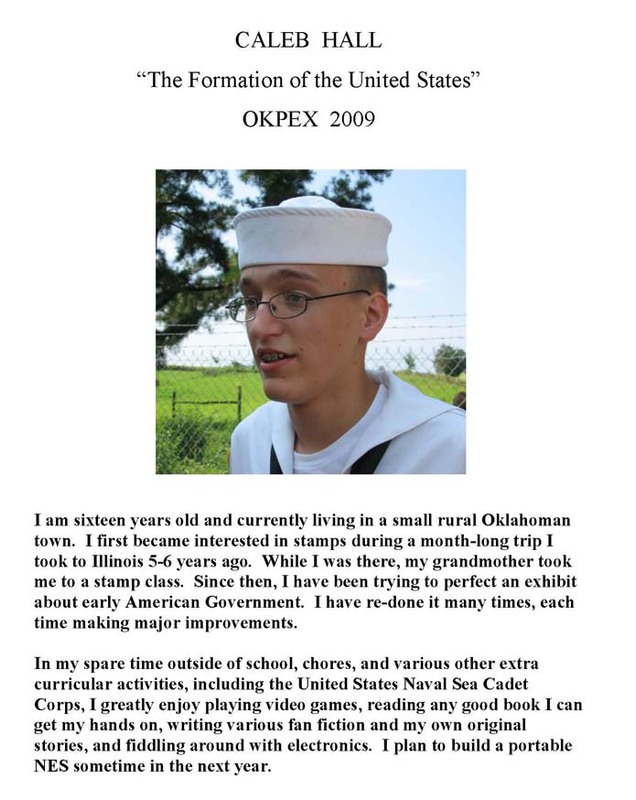 Caleb Hall (15), representing OKPEX 2009 and Filatelic Fiesta 2009,* - "The Formation of the United States" � The events that shaped the formation of the United States. 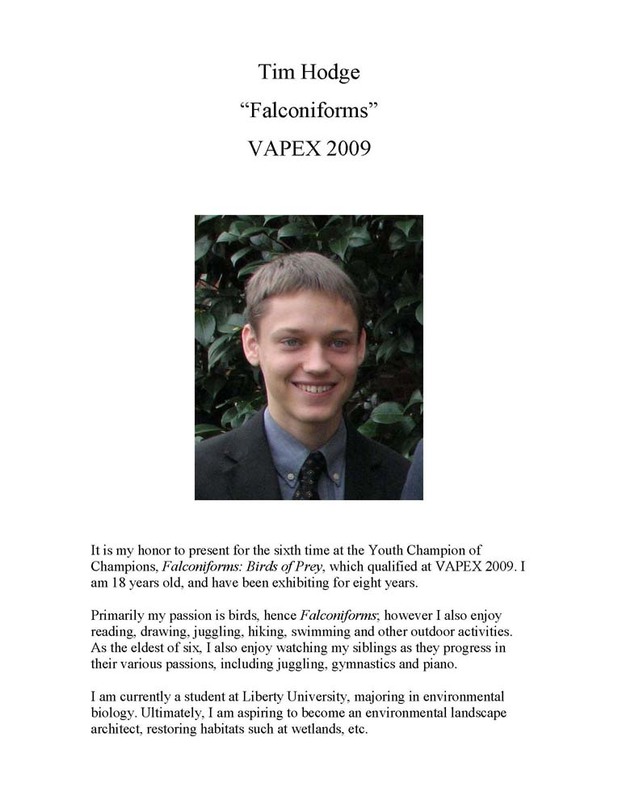 Tim Hodge (18), representing VAPEX 2009, "Falconiforms (Birds of Prey)" � An overview of the taxonomy, characteristics, behavior, conservation, and human uses of Birds of Prey within the order Falconiform. 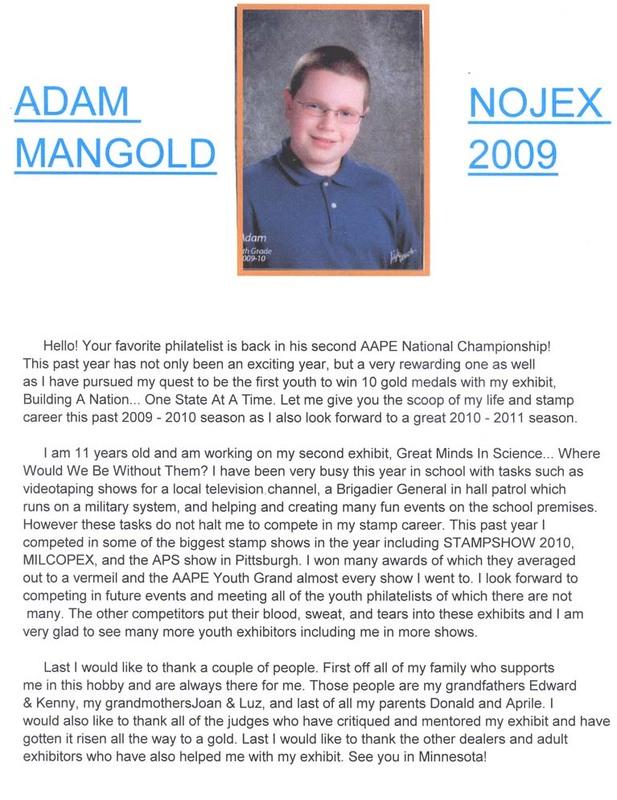 Adam Mangold (11), representing NOJEX 2009, Stampshow 2009, and MILCOPEX 2009,* - " Building A Nation� One State At A Time" � How each U.S. state entered the union. 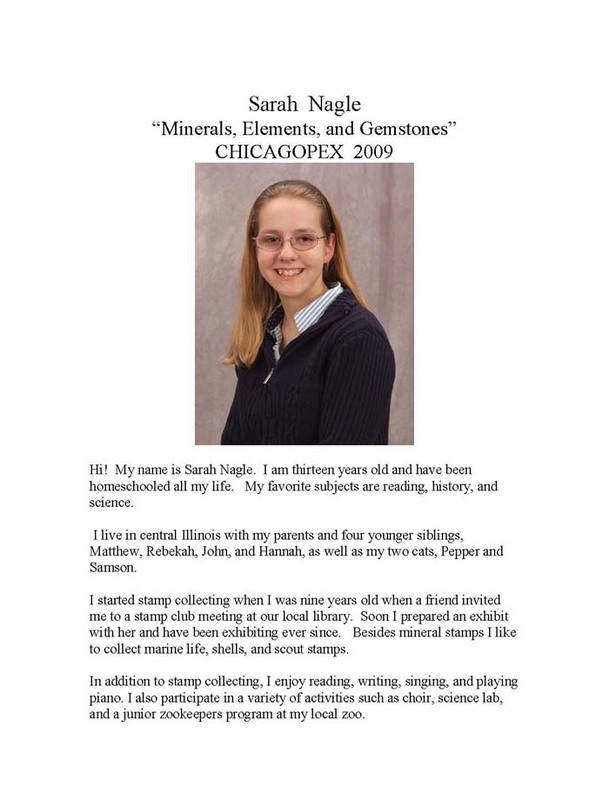 Sarah Nagle (13), representing CHICAGOPEX 2009, "Minerals, Elements, and Gemstones" � This exhibit explores the theme of minerals, elements, and gemstones through stamps, postcards, firstday covers, and much more. 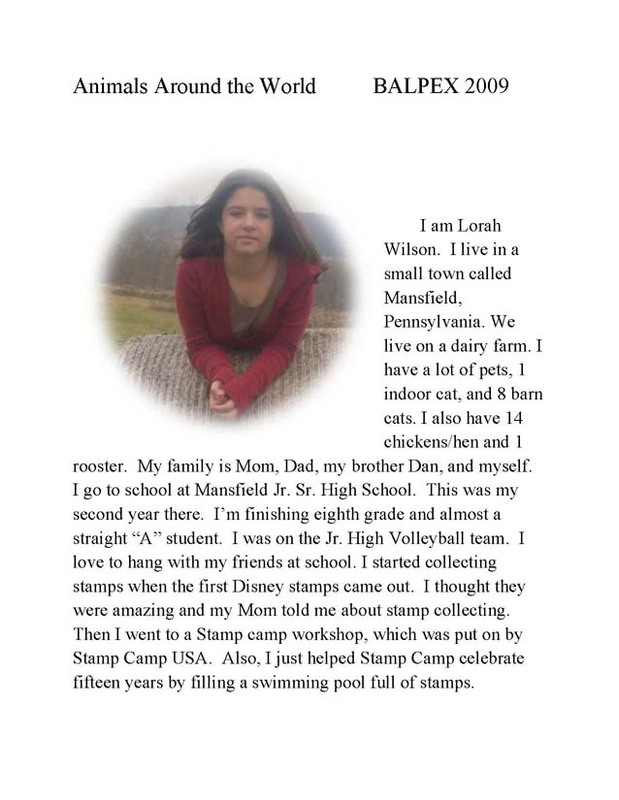 Haley Oswald (10), Minnesota Stamp Expo 2009, "Greetings from Minnesota: A Philatelic Exploration" � This collection looks at the usage of stamps in Minnesota through history, events, people, places, animals and things. 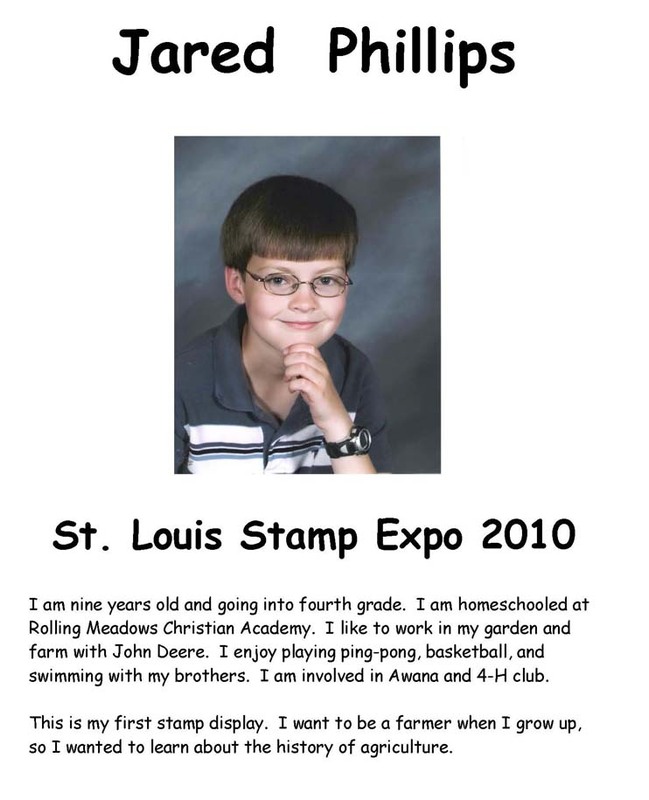 Jared Phillips (9) representing St. Louis Stamp Expo 2010, "Farming Through the Ages" � A look at the development of farming. 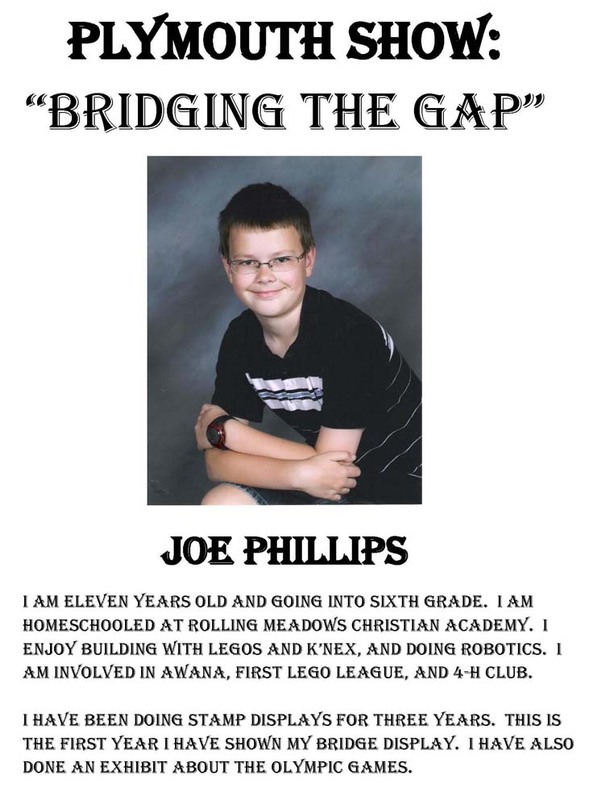 Joseph Phillips (11), representing Plymouth Show 2009, "Bridging the Gap" � Exploring the different kinds of bridges, how they are built, and what they accomplish. 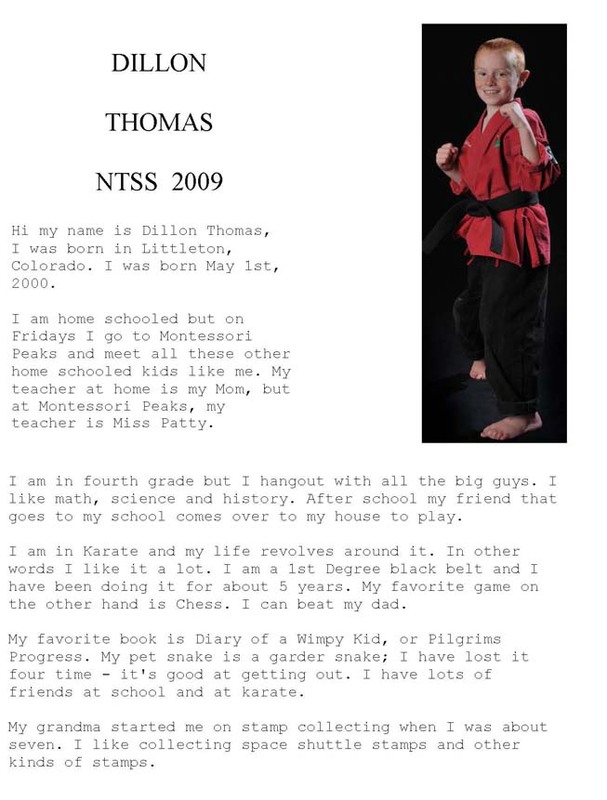 Dillon Thomas (10), representing NTSS 2009, "U.S. Space Shuttle" � Tells about U.S. Space Shuttle Program. 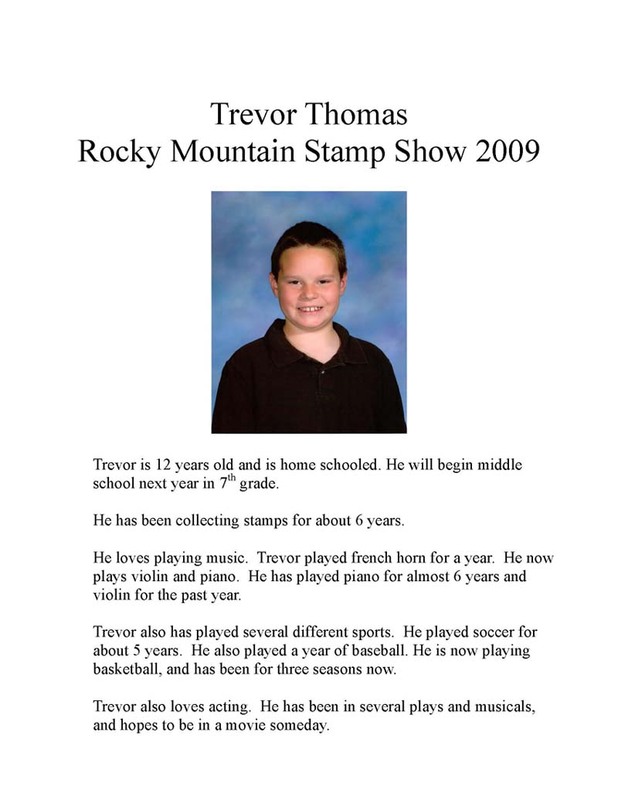 Trevor Thomas (12), representing ROMPEX 2009, "The Game of Soccer" � This exhibit tells about the game of soccer and its various competitions. Lorah Wilson (14), representing BALPEX 2009, "Animals Around the World" � The exhibit includes endangered species and domestic animals. The animals are from all parts of the globe.